Walnut Hill Farm is a beautiful location for your wedding. With a beautiful hilltop barn with all the beauty and versatility you could want. In this image Dustin and Courtney prepare for the garter toss as the day is winding down. As the guest look on Dustin took a little different approach to removing the garter. With his head covered by the wedding dress the guest laugh and celebrate. 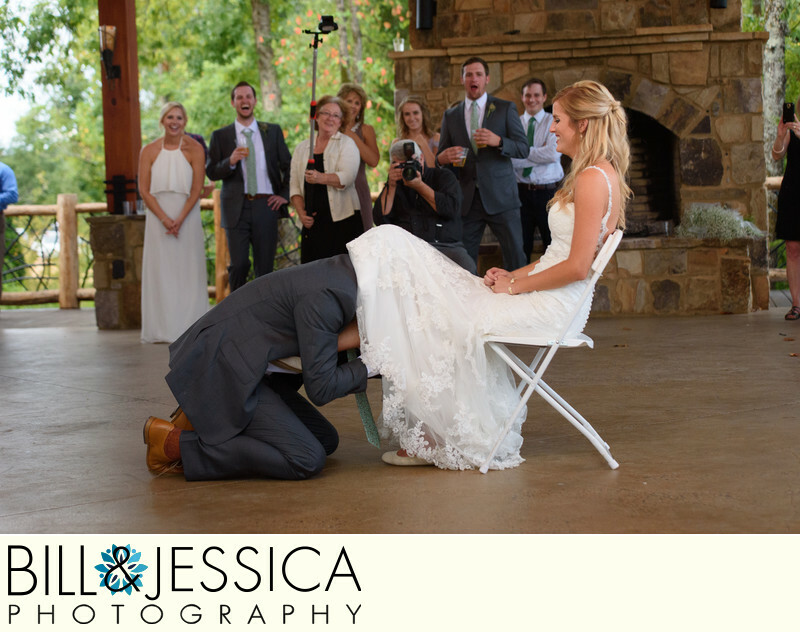 Even the bride in this image thought it was a hilarious way to remove the garter. We have a number of images that are available in wedding gallery. You can also check out our "About Us" to find our what our approach to photographing a wedding event. If you want to contact us, we are just 60 seconds away. WHAT IS WALNUT HILL FARM? Walnut Hill Farm is the go to wedding venue in the Dalton area. This location has numerous amenities to meet your every expectation. We provide wedding photography for weddings in the North Georgia and East Tennessee area. In this role we see a location that make your wedding images look as good as you. We are not wedding photographers for just a few specific locations. Instead to are honored to work at wedding venues at various locations in North Georgia and East Tennessee. WHERE CAN I FIND A WEDDING VENUE IN TENNESSEE? We have pretty comprehensive listing that we compiled complete with links to the venues website or Facebook page. Just take a moment to see out Tennessee wedding venue listing. WHAT IS THE BEST WEDDING VENUE? The best wedding venue is the one that fits your style. If you a bit on the country side of things then a barn wedding venue may be your best fit. On the other hand, if you like the city lights and formal atmosphere then a downtown location may be what you are looking for. Again, we have a listing of Georgia Wedding Venues and Tennessee Wedding Venues. Location: 800 Lee Bryant Rd NE, Dalton, GA 30721. 1/200; f/4.0; ISO 2500; 70.0 mm.